Prepare yourself for another essential tech briefing, courtesy of our friends at TechRadar: we've got news on devices from Microsoft, Google, Samsung and LG, as well as some handy updates for the Bing search engine that just might get you to give it another go. Remember Microsoft's Bing search engine? It just got a bunch of new features as Microsoft launches another bid to tempt you to switch away from Google or whatever it is you're currently using – those features include improvements to the "intelligent answer" system (designed to give you more reliable answers), an integrated hotel booking feature for easier trip planning, and better weather forecasts so you know if you'll need a coat. We've only just seen the LG G7 ThinQ appear, but LG isn't done there, and we're expecting the LG V35 ThinQ to show up very soon (that ThinQ moniker indicates the extra artificial intelligence on board, by the way). Based on some leaked specs, LG's two 2018 flagships will be very similar, with a slightly bigger screen on the LG V35 ThinQ the most significant variation. Within the next few months, we should know for sure, once the phone launches. It's a long way from the chalkboards of old – Microsoft just unveiled the Surface Hub 2, its second take on the digital whiteboard of the future, and it's an impressive piece of tech. 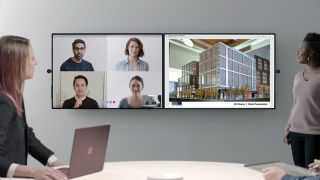 You get a 50.5-inch, 4K+ resolution screen for your meeting room or classroom, and can even tile several screens together to make one huge display. It'll be out next year, but expect to pay a lot for it – the first Surface Hub cost in the region of $9,000 (about £6,680). If you own a Samsung Galaxy S9 or S9 Plus, you just got a free upgrade – Google and Samsung have rolled out support for ARCore into the phone's software, which means you can take advantage of apps using Android's built-in augmented reality trickery. If you're not sure where to start, the ARCore app on Google Play is a good bet, and you can also search through the Android app store to find third-party apps making use of ARCore. Continuing the theme of upgraded hardware, Google has added some extra functions to the Pixel Buds wireless earphones. You can now double-tap the side of one of the Buds to skip a track, so you don't have to suffer through a song you're not all that keen on during your morning run. You can also now triple-tap the Pixel Buds to turn them off, whereas previously they'd remain on until they died or were returned to the charging case.